Regarding Health Insurance for Members hired for the 2014 school year and beyond. FROM MARK KELLY - "I am pleased to share that the Board of Education has approved funding to reduce the contribution amount employees hired on or after July 1, 2014 contribute to the health benefit premiums. The Board of Education collaborated with SMMCTA and SEIU to make a change that will immediately increase the contribution and reduce the employee contribution by approximately $235 for a single party, $474 for a two-party and $615 for a family. We highly recommend all employees participating in the district's health benefit program carefully read the rate sheets included in the district newsletter. SMMCTA and SMMUSD Articles Open for Collective Bargaining for the 2018 - 2021 Contract. The Santa Monica Malibu Classroom Teachers Association represents the employee groups: Child Development Teachers, Early Childhood Teachers, K-12 Teachers, Speech and Language Pathologists, Counselors, Librarians, Adult Education Teachers, Substitute Teachers, Nurses and other non administrative positions within the Santa Monica Malibu Unified School District. Represent our members in all matters related to employment conditions and employer-employee relations, including but not limited to wages, hours and other terms of employment. Form a representative body capable of developing group opinion on professional matters and to speak with authority for teachers. Promote the professional development of our members. Advocate for high quality public educational opportunities for all children. Advocate for adequate school funding from the state, federal and local governments. Provide an opportunity for continuous study and action on problems for the profession. Provide a means of representation for its ethnic/minority members. Promote professional attitudes and ethical conduct among members. Encourage cooperation and communication between the profession and community. "Teaching for me is an opportunity to invest in a student’s educational future which is what keeps me motivated to continue teaching; especially during the difficult times. I became a teacher because I was lucky enough to have amazing teachers who helped shape me into the person I am today and I wanted to have the same impact on the students I teach. I also enjoy seeing students make growth in their learning and as an individual during the time they are in my class. The best feeling as a teacher is seeing the “light bulb” moment when a student was struggling with something and finally has success!" You can read the entire piece from SMDP here. Nahla Seikali has been at Malibu High School for the past three years, but has taught for 20 years. Her career in math started when she volunteered to help with Math testing at her own childrens’ school. She realized how much she enjoyed testing, but more so that she would like to teach them the concepts, not just test them. She has always been passionate about math, was at the top of her class, and loves seeing kids light up when they finally get concepts they have been struggling with; their hard work inspires her. In her own words - "I hope to teach my students how to appreciate not only math, but themselves. I hope to show them how to understand math, not just replicate formulas. My goal in doing this is to show the students that they can do more than they ever thought before." When does Julie Clark find the time to do literally anything? The question rears its head multiple times during a conversation with the multi-hyphenate mother. Clark, the 20-year Santa Monica Malibu Unified School District veteran, took a moment during her fairly regimented day to talk about being a teacher-mom-breast-cancer-survivor and fulfilling a lifelong dream of becoming an author. “It’s been many years in the making,” Clark says in a phone call during her lunch, sandwiched between class periods where she teaches at Roosevelt elementary. “I think fifth grade was when I first realized I wanted to be a writer.” You can read more about Julie's story in the SMDP here! Miriam Brock started at SMMUSD 13 years ago as a Special Education Kindergarten Teacher at McKinley and currently services as the Assistive Technology Specialist for the Special Education Department for the entire district. The two things she is most excited about are. Her first goal is "allowing our non-verbal students a means to communicate through the use of iPads and specialized communication apps. Helping our classroom teachers in integrating language and use of AAC into the everyday curriculum is one of my goals this year." And the second goal "relates to our students with more mild learning disabilities. Getting appropriate computer apps and extensions (such as our current program Read&Write for Google) into all of our special education and collaborative classes for students to access." Miriam says "I have to say that I still get chills when one of our nonverbal students generates their first oral words with the use of their iPad and Proloquo2Go." You can read the full Educator Spotlight article here. Jessica Katz is in her 6th year of teaching, her 3rd in SMMUSD, previously teaching in Fountain Valley in Orange County. She has a long history of working with kids and has always loved it. She’s worked as a baby sitter, camp counselor and at a Kids Club at a gym. She is currently teaching math and ASB/Leadership at Lincoln Middle School and has also taught public speaking, cooking and will teach dance this summer. Math was always her favorite subject. “I liked that there was a method and an answer,” says Katz. I had two incredible math teachers in 7th and 8th grade who inspired me to want to teach math. They encouraged me, challenged me, and stayed positive that I was good at math, even when I did not do so well on a test. I want to be them for my students. One of my favorite topics to teach is percents. This includes discount, markup, tip, tax, simple interest, and commission. With the help of another teacher, I designed various activities related to these topics. For example, for the commission lesson, students pretend to be car salesmen and realtors. They sell cars and homes of various prices and calculate their commission based on the sales they brought in. Students have a blast with this activity, trying to see who can make the most commission. Because this unit is so connected to students and their experiences, great real-life conversations are had about these different topics. One of my favorite parts of being a teacher is those “ah-ha” moments students have when something just finally clicks for them. I know I’ve done a job well when students leave my classroom and thank me for teaching them as they leave for their next class." You can read the full Educator Spotlight article in the SMDP here! Kristin Jurewicz started out as a substitute teacher in Ann Arbor, Michigan before moving to Santa Monica. She’s now been with SMMUSD for 14 years and has always been an 8th grade science teacher at John Adams. Jurewicz values the science education at JAMS for multiple reasons. She values the block schedule because it allows students the time to engage in labs and hands on science activities, while giving the students time to analyze their results. She also finds the science magnet program to be an asset. One of her favorite 8th grade science projects is when the students make Mousetrap cars. Building the car requires students to apply the physics concepts they’ve learned in class. "This is my second year as the science magnet coordinator. I enjoy working with the board to keep our science program current with the ever changing world. Through the science magnet program students have many different options of extracurricular activities that are science related. While in this program students have a chance to visit Catalina Island, Yosemite and Astrocamp, along with family camping trips to Morro Bay and Joshua Tree. And I love working with my colleagues in the science dept. "I am excited about implementing NGSS (Next Generation Science Standards) over the next few years. The standards have more opportunity to go in depth with topics to hopefully build a life-long understanding of science. My goals as a teacher are to engage students in a way that they want to continue in a science field once they leave middle school. "I like working with middle school students because they are starting to gain their own voice. We can have lively discussions about space exploration and nuclear power. I feel appreciated from the students when they show interest in what we are doing in class. I like it when they take control of their education." You can read the full Educator Spotlight article in the Santa Monica Daily Press here. Shannon Bishop’s career as a Speech/Language Pathologist (SLP) began when she took an introductory course in college. She immediately made it her major and continued at the University of Redlands to get a BA and MS in Communicative Disorders. She has now been an SLP for 20 years, having worked with people from 3 to 103 years old. She actually began by working with adults and the geriatric population in Skilled Nursing Facilities and Rehabilitation Hospitals. However, this year is currently her 16th in Santa Monica Malibu Unified School District. I really enjoy working with people of all ages to improve their ability to communicate with others. Every day (even every hour) is different, just as every student is different. When you have been working on something for an extended period of time and you see the light go on in a child’s face as they understand, it’s the best feeling in the world. One of my ongoing goals is to get people to understand that I am a Speech-LANGUAGE Pathologist. This means that I do more than teach sounds. I also work on language skills. Speech encompasses articulation, phonology, stuttering, voice disorders and whatever affects the actual sounds of the words being said. Language refers to syntax, morphology, pragmatic (social) language, semantics, and whatever affects the content of what is being said. Being a pathologist means that I have the training to assess for and treat various communication disorders. Since /s/ is one of the most common articulation errors for students who come to work in speech therapy, this semester I have started doing class lessons in first grade to teach the /s/ sound. In each classroom I did a short 20 minute lesson on the parts of your mouth and how to use them to make a good /s/ sound. I hope to go back next semester and teach another sound. An SLPs job is to strive to make him/herself obsolete. My goal is to help kids meet their state standards to aid in becoming effective communicators throughout their lives. 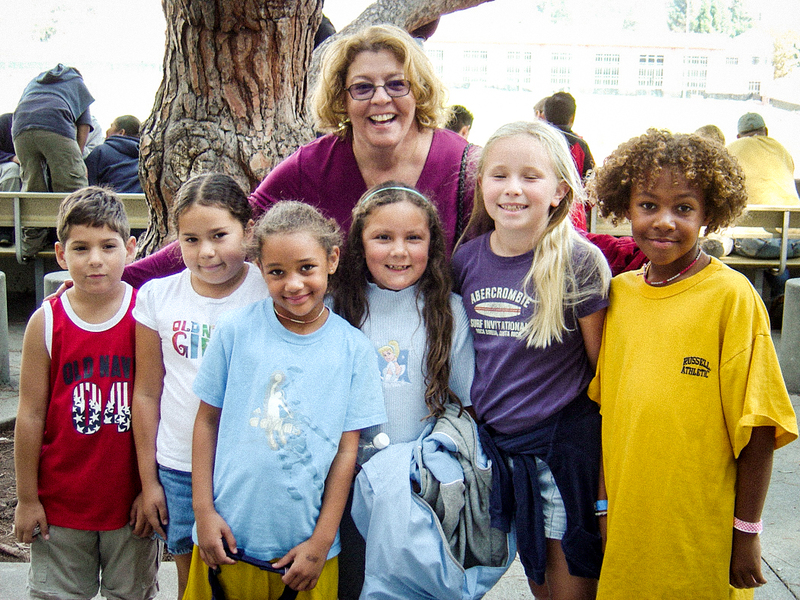 ​Martha Vasquez has taught Kindergarden at Will Rogers Elementary for the last four years. Vasquez started off planning to earn a degree in Design, but she didn’t settle for that. Instead, she found, by working as an instructional assistant with SMMUSD, that teaching was what she loved to do. “The impact of seeing great teachers in action inspired me to change majors – Design became plan B,” she said.She has been with SMMUSD in different capacities for years. First as an instructional assistant for preschool, a long term sub at Grant Elementary, a 3rd and 4th grade teacher, until moving to Will Rogers as a Kindergarden teacher. “My biggest inspiration when teaching is art! I love incorporating art in my teaching and enriching learning in other subjects with the use of the arts. I feel that art allows my students to express their creativity and individuality. It is very important to learn to create and appreciate visual aesthetics and to be able to think creatively! Hopefully my students will learn to always aim for progress — not perfection," says Vasquez. ​Peggy O'Meara is a fifteen year veteran of SMMUSD. O’Meara started off at JAMS as an Instructional Assistant in an SAI classroom and then moved on to teach SDC science and math for 5 years. Her next 5 years were spent at Grant Elementary teaching an SDC 4/5 class. Now she’s just finished up her fifth year at Roosevelt. In her current assignment O’Meara is most excited about the team of Special Educators she works with. “They are fantastic and dedicated to the field. Every school I’ve worked at it has been this way. The hours we put into our job goes on around the clock. I am often talking to my school psychologists at 11:30 at night just to continue a discussion about a student we need to problem solve for,” she said. Tisha Marie Reichle was "tricked" into becoming a teacher. She took one education class during graduate school where a requirement was to observe a high school classroom. The teacher then asked her to sub while she attended a conference. From that day on Reichle was "hooked." Reichle has taught for 16 years at SMMUSD and during her tenure, she has taught 9th, 11th and 12th grade English, including a women's literature course. In line with new State Standards, her teaching is focused on active, critical reading to prepare students to develop their writing. Reichle says "when students make a concerted effort to participate in the learning process and subsequently improve their reading and writing skills, all of my time and energy are rewarding. It's encouraging to receive emails from former students about how they implement what they learned in college classes." Read the full Educator Spotlight article in SMDP about Ms. Reichle here or her own work at www.tisharichle.com.